Choroidal neoplasms are tumors of the choroid of the eye. The most common intraocular tumors are in fact, malignant melanomas of the choroid which increase in frequency as we age. 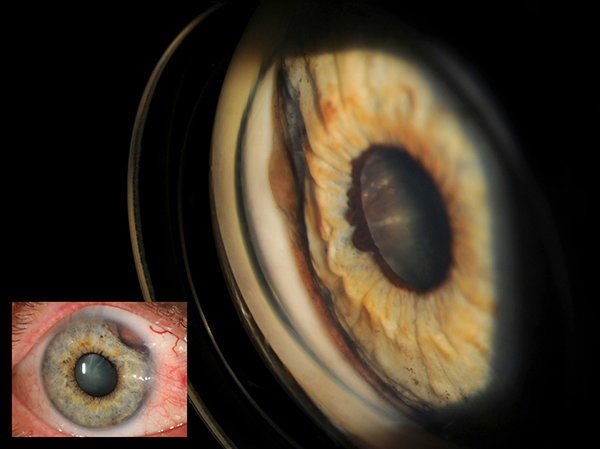 This case study came from a 66 year old white male who presented to the Moran Eye Center with a dark brown pigmented iris lesion in the 2 O’clock position in the right eye. Upon slitlamp examination it was noted that the outer iris was being pulled down and in at the 2 o’clock position exposing a brown elevated wall to the ciliary body. Gonioscopic photos were taken of the right eye revealing the pulled iris in that position. There was slight angle involvement of the pigmented growth and it was occupying 3-4 clock hours in the angle. The gonio photo also reveals a continuation of the pigmented growth along the walls of the ciliary body when looking through the pupil. The margins of the growth extend beyond the keyhole view from the gonio lens. 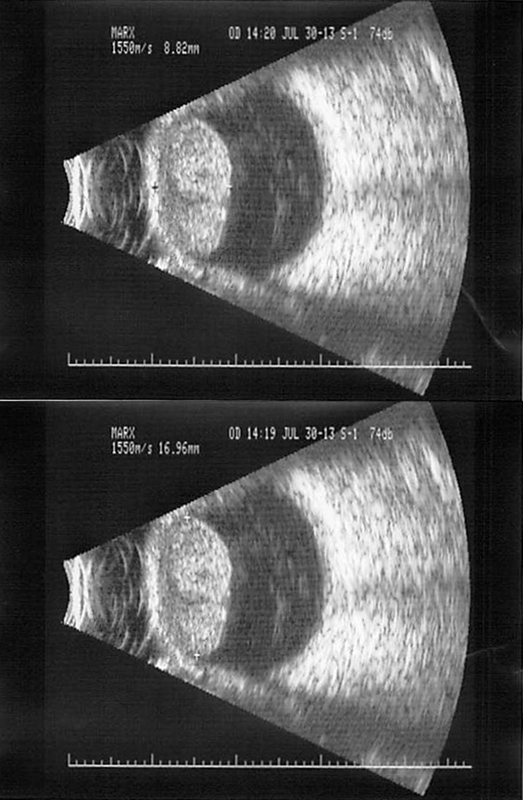 Ultrasound images were taken of the right eye revealing a choroidal neoplasm with dimensions of 16.96mm by 8.82mm. a metastatic work up was normal and the provider has recommended an enucleation of the right eye. All imagery provided by James Gilman of the Moran Eye Center.